Summit to the saddle of the tallest peaks in centrail Arizona/Phoenix area. 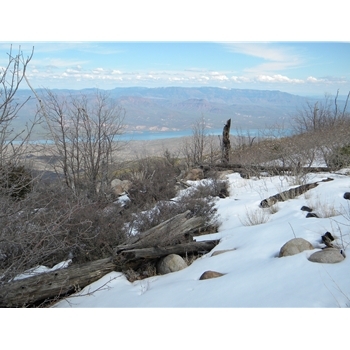 Features and Interests: Highest peaks of central Arizona; great 360 degree views. Trail Description Begin the hike at the well marked trailhead #133 (head straignt up, left would take you to Four Peaks Trail 130). Beginning as a moderate incline numerous water bars cross the well defined path. The forest is lush and untouched by the 1996 Lone fire in the beginning, but as you hike, you will see the consequence of a careless cigarette bud. As you continue up the switchbacks, you will see some nice rock formations and excellent opportunities for photos. Shortly after the green forest gives way to the burn areas with recovering Manzanita bushes. Continue hiking along the trail and the eastern views of the Tonto Basin and Roosevelt Lake open up. Eventually the trail hooks up with the Amethyst Trail #253; you might not even notice the intersection of the meeting trails. Follow the Amethyst Trail for a short distance up to Browns Saddle. The saddle gives amazing views of the Phoenix Valley to the west and surrounding formations/lakes. On a clear days you can see Camelback, Squaw Peak, and other small landmarks of the valley. Accomodations: (on site) Camping Directions: From Shea and SR87 (Beeline highway) intersection, the trail parking area is about 37 miles. From Shea Blvd east bound ending turn left onto SR87. Follow SR87 to the Four Peaks turnoff which is FR143. FR143 is well marked dirt road on the right. Follow FR143/FR401 for about 19 miles on the semi maintained dirt road to the Mazatzal Divide. Turn right here onto FR648/Pigeon Spring Rd. and follow it about 2 miles to the trailhead parking (make sure to take a left just before the end; taking a right will take you to a great lookout/picnic area). Accessibility: Good dirt road with rough patches, off-road vehicle recommended. © AZTrailHeads 2010-2013. All Rights Reserved.